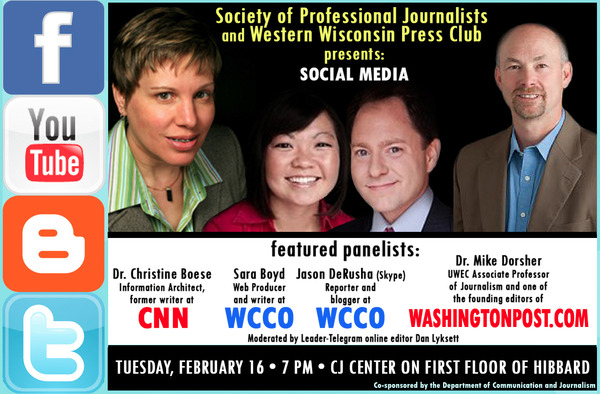 EAU CLAIRE — The University of Wisconsin-Eau Claire chapter of the Society of Professional Journalists is collaborating with the Western Wisconsin Press Club to host a panel discussion on social media at 7 p.m. Feb. 16. The event is open to the public and will be held in the Communication and Journalism Media Center on the first floor of Hibbard Hall on lower campus. 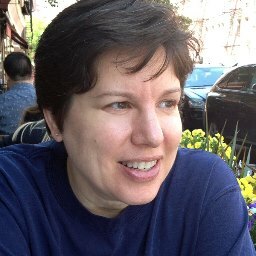 UW-Eau Claire alumna Chris Boese, an information architect for the New York City-based Web consulting agency Razorfish and a former writer for CNN. Dr. Mike Dorsher, associate professor of journalism at UW-Eau Claire and one of the founding editors of washingtonpost.com. UW-Eau Claire alumna Sara Boyd, a WCCO-TV Web producer. Jason DeRusha, a WCCO-TV reporter and blogger, who will participate via Skype. UW-Eau Claire alumnus Dan Lyksett, an online editor for the Leader-Telegram. He will serve as moderator. The discussion will focus on how social media is shaping today’s newsroom and will answer questions about how social media can be used. Panelists will talk about professional and personal boundaries and issues to be aware of when using social media tools. Video clips on how newsrooms have used social media in the past, including CNN’s coverage of Iran, also will be featured. The UW-Eau Claire department of communication and journalism is contributing to the support of the program. On Tuesday, Feb. 16, members of the Eau Claire Chapter of the Society of Professional Journalists and the Western Wisconsin Press Club presented a panel of experts who addressed the use of social media in print and broadcast news today. Dr. Christine Boese, information architect and former writer for CNN, Sara Boyd, web producer and writer for WCCO, Jason DeRusha, reporter and blogger for WCCO, and Dr. Mike Dorsher, associate professor at UW-Eau Claire and one of the founding editors of The Washington Post’s website, made up the panel. The discussion was moderated by Leader-Telegram online editor Don Lyksett. The event was held in the CJ Center in Hibbard Hall, with all panelists present except DeRusha, who joined the discussion via Skype. The SPJ president, senior Jenny You, said the organizations presented the panel discussion in hopes of educating journalism students on how professionals use social media and what guidelines to follow when using it themselves. A national survey conducted by George Washington University and Cision found that a majority of journalists routinely use social media sources when researching stories. The online survey, conducted in the fall of 2009, found 56 percent of the 371 print and web journalists surveyed said social media was important or somewhat important for reporting and producing stories. Of those who utilize social media, 89 percent said they use blogs for their online research. The panel discussion ranged from the pros and cons of using amateur video and other content found on social media websites, whether or not concrete guidelines for using social media could be made and how some newspapers and television stations are using social media to draw in their audience and even find sources for stories. DeRusha said he routinely uses his Twitter account as a promotional tool to capture his audience’s interest and to learn about issues that could be newsworthy. He also said he thinks his audience likes the fact that they can contact him. “… You show people that you’re listening to the opinions of the people out there, not just the elite,” he said. However, Dorsher remained skeptical as to how reliable social media websites can be. “No one knows if you’re a dog on the Internet,” Dorsher said. Throughout the discussion, the audience members were able to pose questions to the panel. Senior Jake Johnson asked about the emergence of social media website users being cited as sources in the news. “Suddenly we care about what anyone who has a Twitter account says,” Johnson said. Boyd responded to Johnson’s question, saying it was a “tricky thing to balance.” She said that while social media users’ opinions should not substitute for experts’ opinions, they could still be useful to gather and report on the opinions of locals. Boyd said social media, when used in a positive way, is an asset to journalists. She said it was important for journalists to find a way to not spam their users with constant messages and to use the websites wisely. This article was originally published in a Feb. 18 issue of The Spectator. Nemec is a junior print journalism major and a news editor for The Spectator.